How do I know if my residential garage door is well balanced? 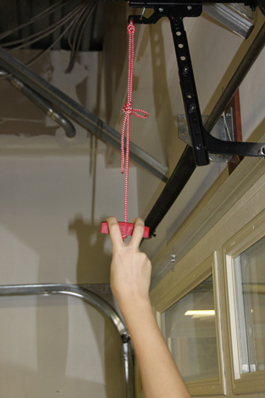 If you have an electric garage door opener, deactivate the system by pulling on the red cord attached to the trolley. You should be able to easily lift the door open with one hand, regardless of its size or the material it is made of. If you notice the door is harder to open, this means that its dead weight is heavier than in the ideal range of 8 to 12 lbs. (3.5 to 5.5 kg) because the springs are no longer counterbalancing the door properly. Call a GARAGA-certified installer to correct the situation.